A lovely hostel in a great part of Georgetown. Quiet at night so you can get a good nights sleep but only 5 minutes walk from the action - restaurants, clubs etc The staff were really helpful. The breakfast menu was different every day, but could be tailored to your eating preferences. The hostel offers private rooms as well as dorms, with plenty of space, air conditioning and lockers. Each bed space in the dorm accommodation can be made private by pulling a curtain across. I had a great time here. The host is awesome, so helpful! The breakfast is spot on. It varies from day to day. 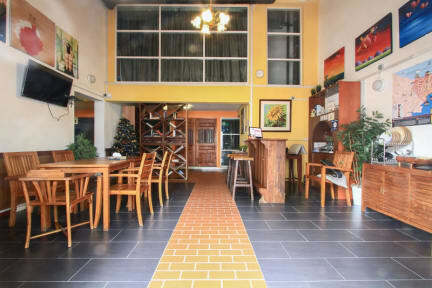 The hostel is a bit far from the main part of town but it is not a very long walk. 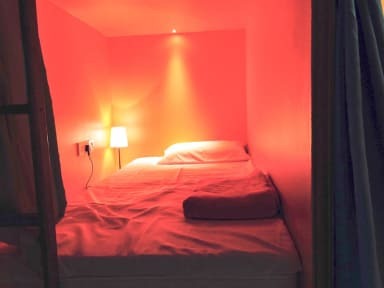 The bathrooms are pretty good and the beds are very private, like in rectangular cubicles. The hostel is actually located near some famous street food stalls so it is great for sampling all of the delicious food in Penang. It really pains me not to give this place 10/10 but I found the location to be the only thing that let it down, It is a bit out of the way from the main attractions. However the staff are all very friendly, in particular the owner who took a lot of time to answer my questions and had loads of suggestions of things to do. Breakfast was probably best I have had in a hostel, different meal every day! First time at a hostel - we got a private room with en-suite. The service was fantastic - we got in a bit late and they stayed up to check us in. It was really relaxed and breakfast was delicious and different each day. I would happily stay there again! One of the best places we stayed on our 10-week backpacking trip! The facilities are super cute and clean... almost like a 3-star hotel. DELISH breakfast that's different every morning. Super friendly, helpful staff. Drinks available on site for purchase. Excellent rooms (we stayed in the queen bed room ensuite) with great bed, pillows, hot shower, TV, and AC. It seriously felt more like a hotel than a hostel. We had to take Grab whenever we wanted to go anywhere since it was so hot. Strong WiFi, quiet at night, great variety for complimentary breakfast and a fantastic location. Thanks Stone! Lovely staff here! Very helpful and kind. I stayed in both the dorm and a private standard room. The dorm is spacious with everything you need. Really big lockers and a little kitchen area as well. The private room was really nice, spacious, comfortable and clean. Even had a sofa and tv. Breakfast is very nice. The staff were great! Very very helpful. And the breakfast was amazing!! Very comfortable hostel with huge lockers. I will stay here again if I return to Penang! The staff was incredibly nice and informative. Facilities are wonderful and clean and location was pretty close to the center without being in the center. Only (small) downside for me was that it was slightly hard to meet people.